Login codes for access to the cloud, SMS reminders for meetings, birthday greetings, voting during MT-meetings. The ways to use SMS within one company using our SMS gateway are countless! Here, you’ll find examples of 10 frequently used SMS applications within a single company. In healthcare – hospitals in particular – a no-show is a common problem, as patients often don’t turn up for their doctors' appointments. This phenomenon used to cost hospitals lots of money. Used to. Because the number of no-shows is vastly declining due to SMS reminders. To reduce no-shows, SMS reminders are sent sometime before the appointment. This reminder is a simple SMS message with a short text, reminding the patient of his appointment. This not only reduces the number of no-shows but also improves the relationship between patient and hospital. 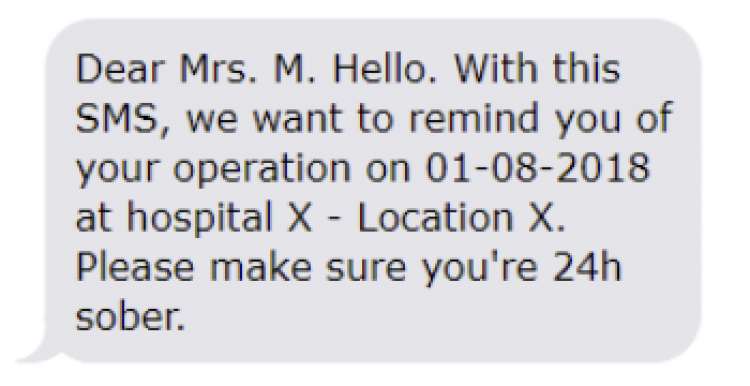 Amongst many others, a medical centre in The Hague (the Netherlands) started a cooperation with CM in 2011, to automatically remind patients of their appointment one day ahead of time. The percentage of no-shows quickly dropped from 8% to 4,5% in just nine months and has continued to do so since. SMS reminders are not only implemented in health care. Many other companies use SMS to remind their customers or employees of an appointment or a meeting. Package delivery notifications are yet another way of implementing this technique. For a company’s logistics or HR department, it is a recurring challenge to organise the logistic/work planning. Quick changes may need to be made and replacements found, especially in case of last-minute changes or when a colleague calls in sick. SMS can be used as a notification tool that always reaches its destination and is read within minutes. 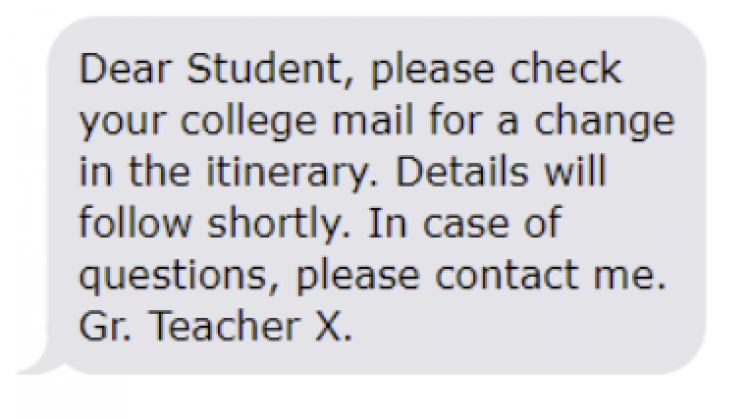 An employment agency, specialised in flexible side jobs, uses SMS to inform students of available tasks and to ask them whether they are available. With these messages, they try to fill in vacancies as soon as possible. 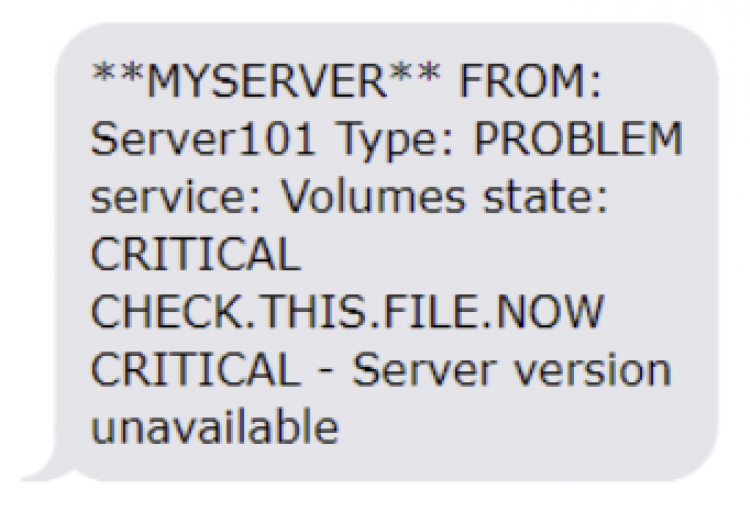 To such a service, you can easily connect an answering service. Reactions are then automatically delivered to your mailbox or web environment. SMS is not just a convenient planning tool for work planning, but for logistic planning for the drivers on the road as well. An international transport organisation which offers its services worldwide, by boat, plane, and truck also uses this technique. The complexity of this service demands a smart and reliable planning system. They realised this by fully integrating SMS in the business critical process of communicating with drivers. When it comes to internal communication, it is important for the information to reach its destination quickly. And to be read quickly. When the information is short and to-the-point, SMS is an excellent channel to inform people instantly and effectively. One example is a company that helps schools send SMS-messages to inform students of schedule changes or newly uploaded grades. To improve customer- and employee happiness, showing you care about their important moments is vital. It’s as simple as keeping a list of customers’/employees’ birthdays, which you can use to congratulate them via SMS. For companies using an HR-system which includes these birthdays, creating a connection to the SMS Gateway is easily made. This way, you can show you care without ever lifting a finger. A company’s marketing department is always looking for the most optimal mix of channels to reach their goals as time- and cost-effective as possible. The possibilities of SMS as a marketing tool are diverse. CM is here to help you, both on the technical and creative level, to get your message across. When you use SMS as a marketing tool, you can personalise both the content and the sender. Also, your target audience can respond to their received messages. When a marketing message is sent, it is important to comply with all regulations. Here, it is important that all mobile numbers are collected the right way. For the IT-department of your company, it is important to be instantly informed whenever -for example- a website is offline, a server is offline or the server’s cooling system is flitching, and so on. If there is no constant monitoring on this, problems like these may not be picked up in time. And damages may be big! By setting up automated SMS alerts, the previously selected numbers will be informed instantly when a certain check is triggered. This way, action can be taken immediately. Privacy and data security demand more attention lately. To increase efficiency and be more flexible, a growing number of companies is introducing Two-factor Authentication for secured access to online working environments. Two-factor Authentication (2FA) is a login method needing something you know (your username and password) and something you have (your mobile phone). This second layer of authentication can be a One Time Password that is sent to the user’s phone via SMS or speech. This way, only the owner of this mobile phone can gain access to your data. Moreover, an SMS OTP can be used only once, and typically is valid for only a few minutes. This makes the login process so much more secure than when only username and password are used. That is why another Dutch hospital uses One Time Passwords to let employees login securely, even when they are outside the hospital. This allows the specialist to assess x-rays from home. Also, the Dutch government uses One Time Passwords for logging in to the DigiD environment, where citizens can find and change forms and personal data. To make use of One Time Passwords, companies typically use a security partner that supplies specialised software to send out these passwords. As soon as a connection is made to the CM platform, SMS and speech codes can be sent. SMS is a popular tool in TV-shows where viewers can vote for contestants. SMS and Voice can be used to select the most popular singer, for example in programmes such as the Song Festival or The Voice do. But it’s not just big shows that can benefit from SMS as a voting tool. Smaller companies can use SMS voting for example in MT meetings, congresses or internal events. Voting for a certain proposition, selecting a new board member or choosing the next company outing. All votes can be followed live, showing you real-time who or what got the most votes. A Dutch bank uses this type of SMS-voting for seminars, staff- and sponsor events for interaction with the visitors and to increase visibility. The SMS messages are shown on a big screen where they also show sponsored messages and -videos. This mobile marketing tool SMS grows the level of interactivity with the audience and makes the threshold to responding as low as can be. Most companies have their alarm notification to security and emergency services in order. However, informing and mobilising their own employees often leaves much to be desired. For example, informing the company’s own crisis team, clearing certain buildings or informing staff of other companies within a certain range. In case of a calamity, it is highly important that this happens easily, without any additional devices (that may not even be available during a calamity). SMS holds the answer. With a special feature, sending just one SMS message with a 4-digit code, can trigger a message that is sent to selected groups. For example, a Dutch high school uses SMS to call in all crisis personnel. For charities, who mostly rely on financial donations, it has become more difficult to bind consumers to their charity. As a result of, amongst others, aging, crisis, waning engagement, not having cash, and expensive collectors, charities see a decline in the number of donations. 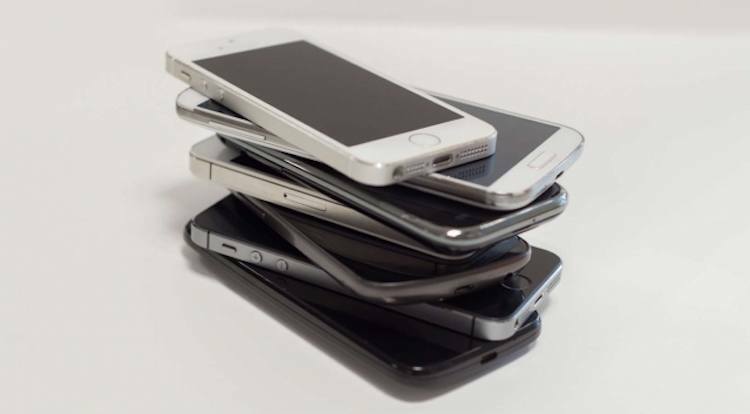 Mobile donations, as SMS donation is also called, provides a solution. 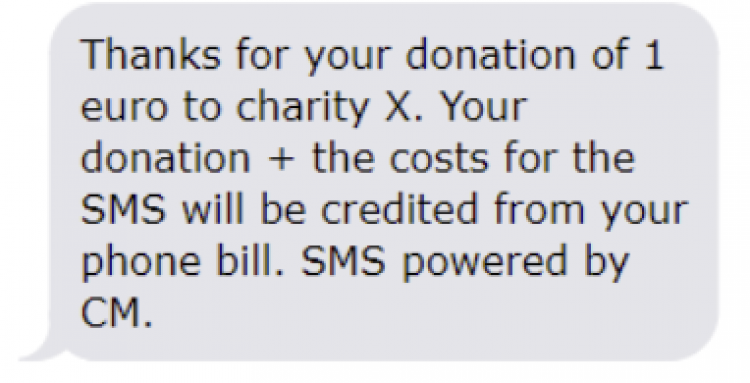 Charities use SMS to lower the threshold to donations. SMS donations are not just for the big charities, also smaller foundations and associations use SMS. The examples of SMS messaging mentioned in this article are based on actual customers but anonymised due to privacy reasons. At CM, each application has its own specialist account manager to provide the best help for your service. Do you want to discover the possibilities of mobile for your company in a casual talk? Please don’t hesitate to contact our account managers or give our platform a try with 10 free SMS messages now!